Keeping things simple as I work the 9-5. There's a lot of paperwork in my work life lately so while sitting for most of the day is not the most inspiring, it definitely gives me excuse to dress casually and comfortably. 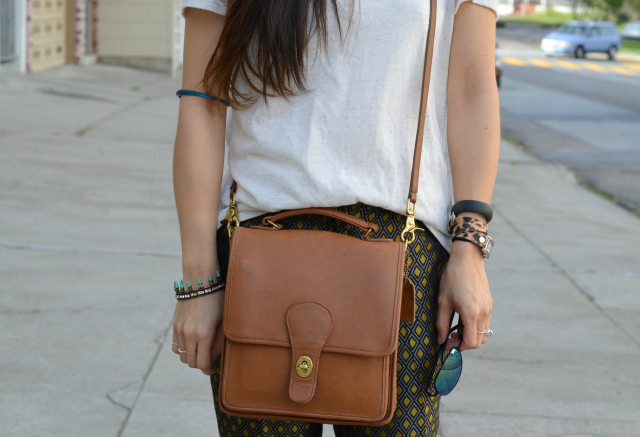 I love the patterned pants and slouchy tee. Both things I aim to own more of. Nice outfit! I totally love the pants and the bag! Well this is a great example of comfy and cute simultaneously! 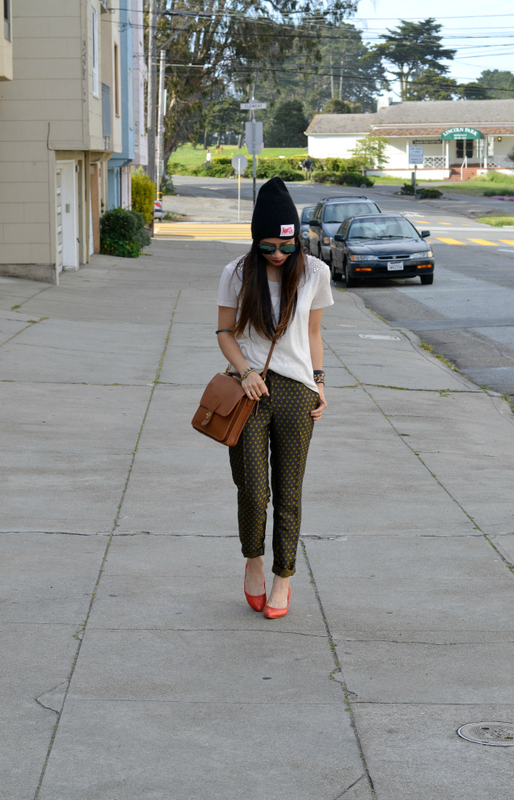 I love these trousers on you and the flats and beanie! Love this outfit! The pants are such a fun pattern and look great with the t-shirt! The shoes are an awesome pop of color! That's one strong look, gorgeous! Like the trousers a lot! Loving the laid back vibe, that cross body bag is amazing. Love your Coach bag! Such a great outift! omgosh you are so cute! I love your shoes, what a bright pretty color for spring time. have a good week! Even though you're casual, you're always so chic!! You look great, I love those pants!! GORGEOUS pants and bag! Love the pop of red with it. Very stylish Nancy! Great outfit! I love the pants!! Thank you for commenting on my blog btw! I would love to keep in touch via bloglovin and gfc! Now that is one stylish girl at work. Way to rock these print pants with such colorful and cute flats! Adorable!! Looks so comfy and chic. love the bag! a friend of my had a vintage coach bag with a similar shape and i've been in the search for it at flea markets! Love your cross body bag and fun red flats! Great casual look! At least your pants are still cute while being comfy! I am all about comfort these days at work. Your comfortable still looks so chic! Those pants are awesome! Love the print! Absolutely love these printed pants on you! Love this look! You're killin' it. Great style. Started following you on Bloglovin' and IG! Looking forward to your next post.